You’re going to love the flavor of this salad and it has so many applications. 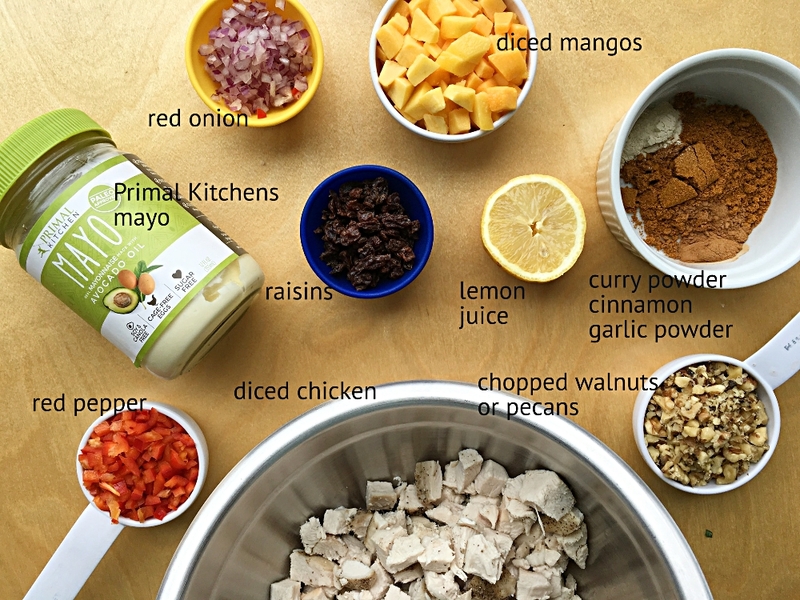 Curried Mango Chicken Salad makes the most delicious wraps to go either to work for lunch, or for travel. Road trip anyone? This Primal Kitchen’s avocado mayo is as clean as they come. No soy or canola oil, just avocado oil. It’s sugar-free and uses cage free eggs and has the shortest list of ingredients I’ve ever seen on a mayo jar. When you go to buy it, look for among the non refrigerated condiments because it’s shelf stable. It’s yummy, clean and convenient. For your info also, I used Trader Joe’s frozen diced mango’s. I chopped them smaller for this recipe. This salad is my new favorite travel food. 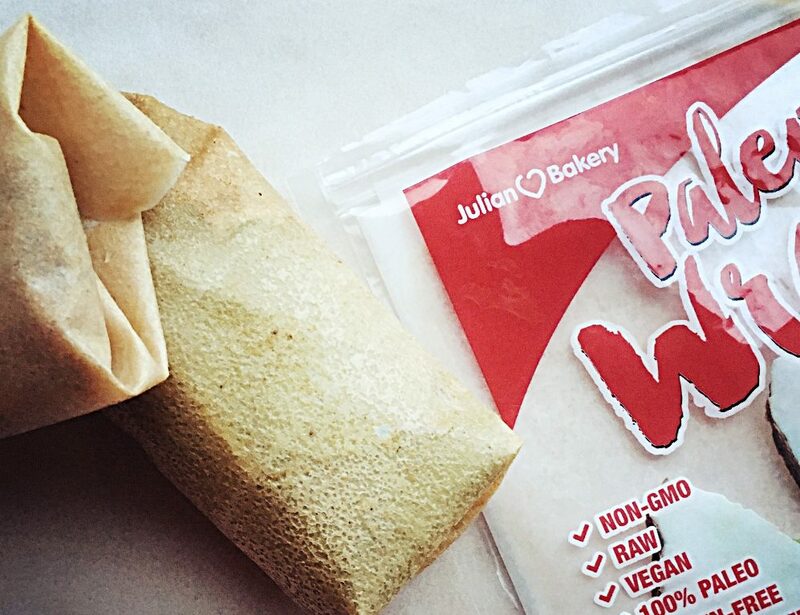 Wrapped up tight in these Paleo Wraps they survived well on a long flight to Nashville. After hours of travel they remained tightly wrapped, not soggy and no tearing. The wraps have a slightly sweet flavor from coconut. I was able to get them (and the mayo) from Thrive Market. They are also shelf stable, not needing refrigeration. For a quick throw together meal, use leftover roasted or grilled chicken. 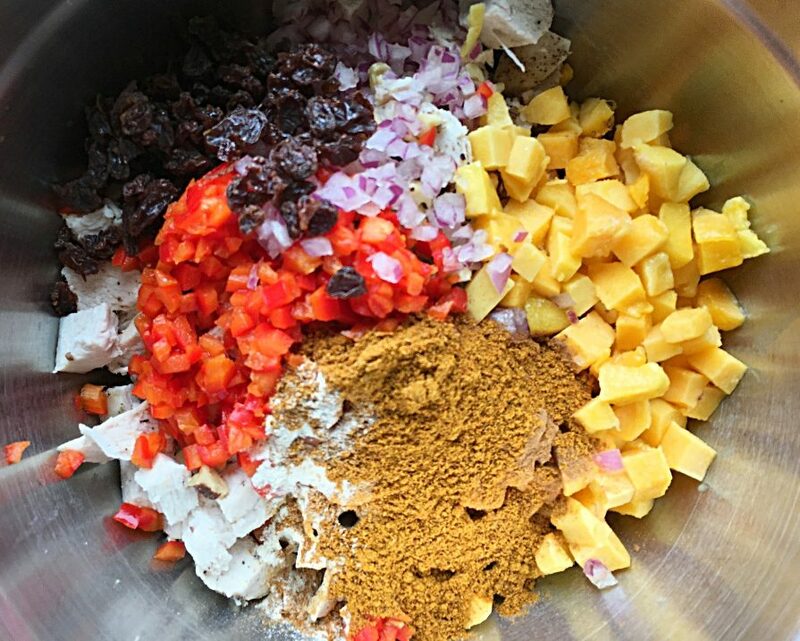 Once everything is chopped, mix it all up and let it sit for 30 minutes or so to let the flavors blend. Now if you’ll excuse me, lunch is waiting. Place all of the ingredients except for the salt and pepper in a medium sized bowl. Mix well and taste. Salt and pepper light;y. Let salad sit in the fridge for 30 minutes (or up to 1 day) to allow flavors to mingle. Adjust seasonings if necessary. Serve in a wrap with avocado slices and lettuce, or on a bed of lettuce for a light dinner. The wraps make a perfect travel food! 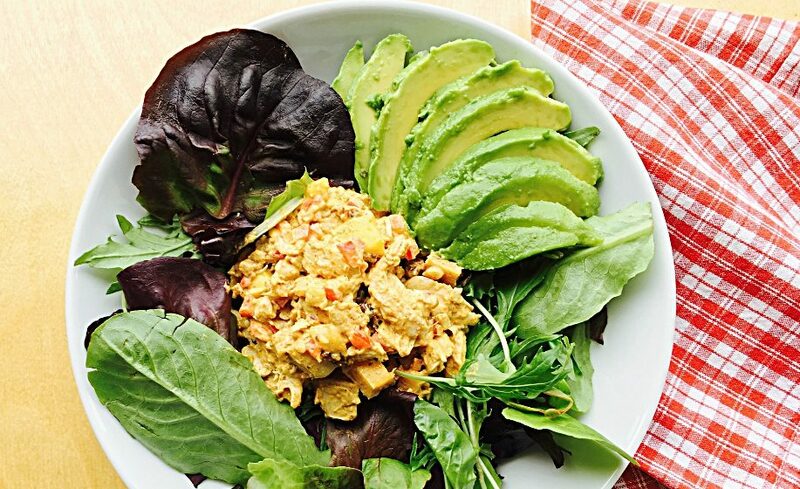 Jerry and I are hooked on your Curried Mango Chicken Salad recipe! Hi Eloise! Good to hear you like it as well as we do. It’s yummy, right? Are you eating it in wraps or as a salad?